The Association of Seventh-day Adventist Historians (ASDAH) and Adventism in China (AIC) www.adventisminchina.org are jointly sponsoring this conference at Hong Kong Adventist College (HKAC) on October 30 - 31, 2014. The AIC project aims to develop a comprehensive documentation of the history of the Adventist movement in China. This conference provides a venue for historians, scholars, and researchers, to get together to exchange ideas and explore new grounds. You are cordially invited to submit a paper. For further information or questions, please contact the Conference Chair, Dr. Bruce Lo at lobw@uwec.edu. Full papers or extended abstracts (up to 300 words) may be submitted, via the Paper Submission page, for review by the referee panel. Authors will be required to revise the papers or abstracts into the final form in the lights of the referees' comments. Accepted presentations will be electronically published at the official ASDAH website (this site) to provide a permanent record. In addition to regular research papers, the conference will also consider Panel and Tutorial proposals for possible inclusion in the program. Individuals wishing to make either a panel or tutorial proposal should submit online an abstract (up to 300 words) via the Paper Submission page, clearly outlining the purpose of the proposal and names (and affiliation) of individuals involved. A panel usually consists of three or more experts or knowledgeable individuals who will discuss/debate live in front of the delegates, the pros and cons of a topic or position that is relevant to the conference theme. The panel is led by a panel chair who is responsible for forming the panel group and for submitting the proposal. Please remember to clearly label it as a "Panel" proposal. A tutorial is a presentation usually by one or more individuals on a topic relevant to the conference theme, the purpose of which is to teach or inform the delegates about that topic. Both methodological and content tutorials may be considered. The chief presenter is responsible for submitting the proposal. Please remember to clearly label it as a "Tutorial" proposal. All those who are interested to find out more or would like to consider further whether to attend this conference should complete this form ASAP to ensure you will receive future updates from the conference secretariat. Please note this form is an expression of interest and is not a formal commitment to register. Please go to the Registration Page to formally register for the conference if that is your intention. Taxi: This is the easiest way. Go to the airport taxi stand. The attendants there should be able to speak English. He can help you to get a "Red taxi" and instruct the driver to go to Hong Kong Adventist College, 1111 Clear Water Bay Road, Sai Kung. Cost about HKD 280. Bus to Diamond Hill: Take Bus E22 or E21A to Diamond Hill from the Airport, then take Bus 91 at Diamond Hill to Hong Kong Adventist College. There should be the English words "Hong Kong Adventist College" on the bus sign. This will take you to the front gate of the college. Total cost HKD 18+HKD 8.5. Whole journey takes about 2 hours including waiting time. Bus to Tseung kwan O: Take bus E22A from Airport to Tseung Kwan O (Hong Sing Garden).. The fare for this segment is HKD 24. At Tseung Kwan O, take "minibus" 103M to Hong Kong Adventist College. Ask driver to drop off at Sam Yook. The fare for the minibus is HKD 8.5. Take Trains: We do not recommend this unless you are familiar with the train & MTR system in Hong Kong. You may take Airport Express train to an MRT exchange station, then take MTR to Tseung Kwan O. From there take minibus 103m to Hong Kong Adventist College. 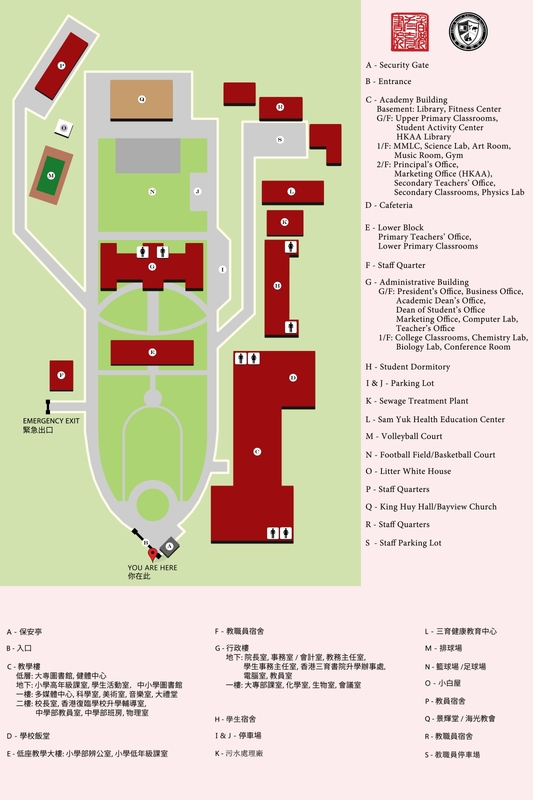 If you need a Map of the Hong Kong Adventist College campus, click this link HKAC CAMPUS MAP to download one.